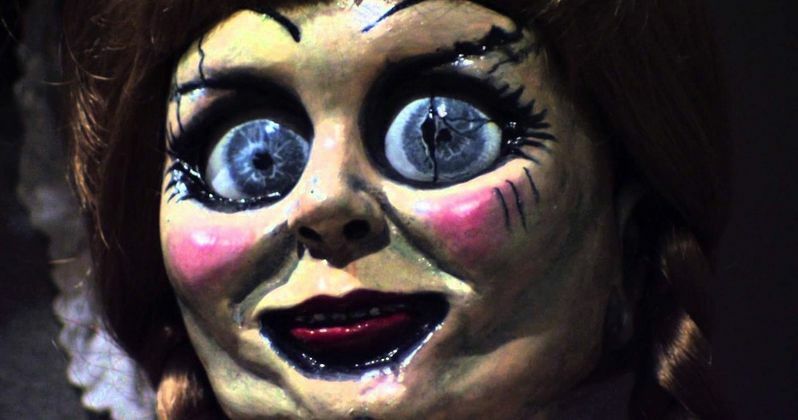 Annabelle 3 is officially happening with Gary Dauberman, the writer behind the franchise, making his directorial debut. The porcelain doll was a key component of The Conjuring, and the past two Annabelle installments have earned over a billion dollars worldwide. Annabelle 2 was a huge hit last year and was almost the highest grossing horror movie of the year, before Andres Muschietti's big screen adaptation of Stephen King's IT came out and became the highest grossing horror movie of all time. In addition to writing the previous Annabelle installments, Gary Dauberman also helped out on IT and has The Nun coming out later this year. While there are no current details for Annabelle 3, it has been officially confirmed that the movie will hit movie theaters on July 3rd, 2019, which should be pretty exciting for fans of the horror franchise. Dauberman has done excellent work writing for The Conjuring universe and fans will undoubtedly be interested to see what he can do behind the camera as well. The Annabelle movies have all been made on little budgets and made big money at the box office, so it really seems like a no-brainer to continue with Annabelle 3, especially with Gary Dauberman on board to direct. Dauberman has written the past two Annabelle movies and his writing style has been one of the big factors for the movies being so popular. Hopefully the streak will continue with Anabelle 3 when it is released next year. While nothing is currently clear about the plot of the third installment, it should be clear that Warner Bros. will continue to make the movies as cheaply as possible to continue the profit trend that started with the first Annabelle movie. In addition to being big earners at the box office, the Annabelle movies have all been critically praised as well. Annabelle 2 initially scored a 100 percent Fresh Rating on Rotten Tomatoes upon its release. The movie is currently at a 70 percent, but that is still higher than the last movie in The Conjuring franchise. The straight to the point horror films are in high demand at this time, which means that Annabelle 3 is gearing up for success upon its release next year. The horror genre is seeing a big resurgence and the Annabelle franchise is at the forefront of the movies leading the charge. Again, nothing is currently known about the plot, but what do you really need to know before seeing Annabelle 3? The porcelain doll will return, and people will die horrible deaths, which is the formula that has been working thus far. No heavy thinking involved, just a fun movie to go see on the big screen and get scared with a theater full of horror junkies while eating some popcorn. You can read more about Annabelle 3 over at The Hollywood Reporter.